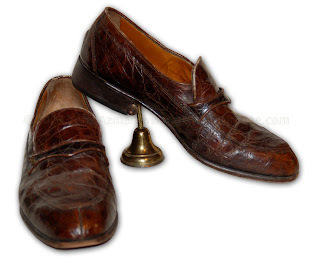 We'll have these wonderful Bally men's shoes for sale tomorrow at the Sunday Antique Market. They're marked "genuine Caiman" model Dino III. Sadly, they're a little edge rubbed, which could be hidden with a generous application of polish, but we've left them just as we found them. The size is 7½. Priced to sell.